Once a quarter, I eagerly await my next shipment of beans from the Rancho Gordo Bean Club. When I hear the loud thud of the box hitting my doorstep, I run out and rip the box open to take stock of what beautiful bean goodies have arrived - I'm never disappointed. Rancho Gordo grows heirloom bean varietals that might otherwise go extinct, since grocery store beans have become so limited and homogenous. I never knew how glorious beans could be before I cooked up my first batch of Rancho Gordo beans. There are so many different kinds with varying colors, textures, sizes, and flavor. Some varieties cook up big, sturdy and meaty, while others are petite, melty, and creamy. Also, these beans don't take forever to cook because they haven't been sitting on warehouse shelves for years and years. I held a bag of scarlet runner beans in my hands and admired their deep eggplant purple sheen with violet speckles and streaks - so beautiful. I knew these scarlet runner beans were destined for a bean salad that would celebrate summer. An overnight soak and hour-long cook rendered the beans plump and substantial with creamy centers, ready to soak up a bright, vibrant dressing. Tossed with summery green beans, ripe tomatoes, and sweet corn, this Two Bean Summer Salad has lots of fun textures and is hearty enough to be a main course. 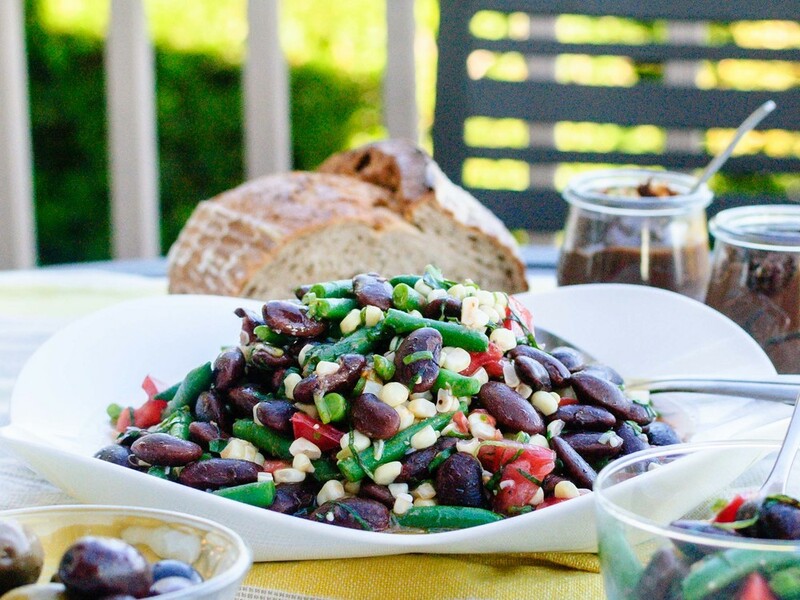 Tote this bean salad along for a picnic alongside a few cups of easy chocolate pudding, and you'll remember why sometimes the ordinary can really be spectacular. Happy summer! Notes: I can't encourage you enough to seek out quality dried beans and cook them up yourself, but I know that sometimes we're in a pinch, and we just need to pull a meal together. Feel free to substitute two cans of beans, drained, and rinsed for the beans in this recipe, if you are short on time (red kidney beans or cannelini beans will work). Just like with Broccoli Cooked Forever or in a good Caesar Salad dressing, even if you're not an anchovy fan, I promise that you won't taste them or anything fishy in the final salad. The anchovies lend a deep, savory flavor that is really delicious in the dressing. In a stockpot or french oven, combine beans with enough water to cover beans by 2 inches (about 6 cups). Bring to boil for 5 minutes, then reduce heat to low, and simmer partially covered, until tender - about 1 hour. Drain and rinse under cold water until beans are cool. Transfer to a large bowl. Meanwhile bring a large pot of water to boil. Prepare an ice water bath by combining water and a few handfuls of ice in a large bowl. Blanch green beans in the boiling water for 2 minutes or until crisp tender, then scoop out the beans with a slotted spoon or strainer and plunge into the ice water. Add cooled green beans to the scarlet runner beans. Next put the corn into the boiling water, reduce heat to medium low, and cook for 5 minutes. Add another handful of ice to the water bath, and plunge the cooked corn into the icy water to cool. Stand an ear of corn flat side down on a large cutting board. Using a sharp knife, cut the kernels from the corn cob. Transfer corn kernels into the bowl with the beans and repeat with remaining corn. Add diced tomatoes, red wine vinegar, salt, pepper, mustard, garlic, anchovies, and olive oil to the salad and mix well. Taste and add additional salt and pepper to adjust seasoning. Sprinkle slivered basil and green onions over the salad and lightly toss to combine. Serve immediately.